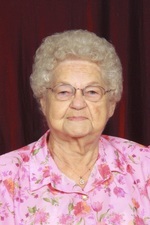 Lucy M. (Esteb) Hogue, 96, of Franklin, IN passed away Wednesday, April 25, 2018 at Otterbein Franklin SeniorLife Community in Franklin, IN with her children by her side. She was born May 14, 1921 in Wanamaker, IN to Ralph and Elsie (Beckner) Esteb. She married Reverend Howard L. Hogue on May 21, 1944 in Indianapolis, IN, he preceded her in death on May 7, 1997. 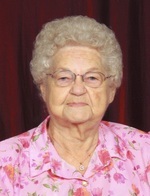 She was a 1938 graduate of Franklin Township High School in Marion County and went on to earn a degree in Nursing from the Methodist Hospital School of Nursing in 1942. Lucy and her husband worked as Medical Missionaries for Baptist Mid Missions to the Central Africa Republic, starting churches and running the mission hospital. They returned to the United States in 1966 due to health issues. They then switched to home missions, starting Baptist churches in Choteau and Dupuyer, Montana. After leaving Montana, they moved to Tell City, IN to pastor the Berean Baptist Church. They retired from Baptist Mid Missions in 1988 and were awarded the Emeritus status. Upon retiring, they settled in Mooresville, IN. Lucy is survived by her children, Duane T. “Tom” Hogue (Marie) of Whiteland, IN, Lucy E. “Ellen” Ehrhart (John) of Sacramento, CA, and Ann M. Zier (Rick) of Cloverdale, IN; a sister Evelyn Crouch of Florida; ten grandchildren; six great- grandchildren; and a daughter-in-law Lori Hogue of Reno, NV. She was preceded in death by her parents Ralph and Elsie (Beckner) Esteb; her husband Reverend Howard J. Hogue; her son David Timothy “Tim” Hogue on August 18, 2001; brothers Charles Esteb, John Esteb, and Ray Esteb; and sisters Mary Alice Glaze and Faye Sisson. Pastor Mark Felber will conduct a service Tuesday, May 1, 2018 at 2PM at Swartz Family Community Mortuary and Memorial Center, 300 South U.S. 31 (Morton Street) in Franklin, IN. Friends may call Monday, April 30, 2018 from 4PM until 8PM at the mortuary. Burial will be in First Mt. Pleasant Cemetery in Franklin, IN. Memorial contributions may be made to Baptist Mid Missions, P.O. Box 308011, Cleveland, OH, 44130-8011 or at www.bmm.org. Online condolences may be sent to the family at www.swartzmortuary.com. Information at 317-738-0202.